Golfers who play often as well as those who only play a few times a year know mobility is essential to a good golf game. Stiff joints and a weak back not only mess with the golf game, but can be the very issues that end up causing an injury. It’s a warm sunny day with a bit of a breeze, you are on the back nine about to sink a putt. When you swing, your back seizes up with severe pain. The beautiful day of golf turns into painfully riding in the golf cart back to the clubhouse, and you limping painfully to your car. If you have ever strained your back during a golf game, you are not alone. 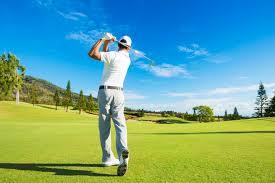 It’s estimated of the 30 million golfers in the United States, 80% have experienced some sort of back pain. As fun as it is, swinging at golf balls puts an individual’s body in an awkward position, opening up the opportunity for injury. While some golfers suffer through the pain by popping over-the-counter medications, others back away from playing as often, or stop altogether. There’s another way to combat back injuries caused by golfing, without meds. It’s not a magic wand, it’s chiropractic care. Golfers are increasingly finding chiropractic care to be a valuable tool to help them deal with back injuries. Here are FORE! ways chiropractors can help injured golfers get off the couch and back on the green. Consistent adjustments can avoid injuries in the first place. Golfing, or any activity, is more enjoyable and causes less chance of injury if an individual’s body is in top condition and operating normally. Periodic spinal adjustments keep the body functioning at maximum capacity, and reduce the chances of being injured. If the neck and back are aligned correctly, awkward positioning such as a golf swing will have a less negative impact. Chiropractic treatment can reduce a golfer’s pain. Back injuries can be extremely painful, and many turn to pain medications to gain relief and comfort. By treating the origin of the pain instead of just the symptoms, a chiropractor helps their patients manage the pain through manipulations, instead of drugs. Over the course of a few treatments, pain is often drastically diminished and much more manageable. A golf injury can heal quicker with chiropractic care. Injuries to the back or neck can heal faster when chiropractors treat them than on their own. Our experienced chiropractors can adjust the spine, and also work on the joints and surrounding tissue that can cause pain and hinder healing. Chiropractic evaluation considers the body as a whole. By treating the entire body, it promotes quicker healing of the injury. Increased mobility can be gained with chiropractic visits. A chiropractic treatment schedule keeps the body loose and strong, and working in optimum fashion. This prevents injuries and increases the chances of playing the game of your life. Golfers need to realize the sport can cause serious injuries just like “rougher” sports like football and rugby. It’s a good idea to stretch before playing, stay hydrated, and avoid overexertion. If you are a golfer, chiropractic care is a valuable tool in staying healthy. Regular adjustments and manipulations keep your body on track and performing with maximum mobility at the top of your game. If you do suffer an injury, our Glastonbury Chiropractors can help you manage your pain and decrease the time it takes to heal. Call Damato Chiropractic Center of Glastonbury or schedule your appointment online today for more information on how we can help reduce the chance of injury for golfers, and promote healing.